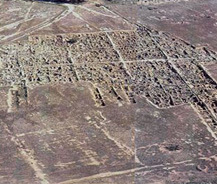 The partially excavated ruins of the city can be found strewn across fields just outside the town of Gazimagusa. Archeological findings at Alasia ( Enkomi ) show that there was settlement in the area during the Middle Bronze Age. Alasia's wealth and subsequent growth was based on trade in Cypriot cooper which during the sixteenth century B.C. was being exported to Anatolia, Syria and Egypt. Alasia's heyday came in the fifteenth century B.C. when Mycenaean trade in cooper with both eastern and western lands was on the increase.